»Ever Tried Unearthing The Legendary Past Of Ikkeri In Karnataka? Shimoga is a beautiful district in the state of Karnataka and is known for the charming and immensely popular Jog Falls. However, there is a lot more to be witnessed within its boundaries. Apart from this famous falls, it has several ancient temples, lush green hills, historical sites and relaxing streams. How about getting yourself to an ancient place in Shimoga district this weekend? If yes, then add Ikkeri to your bucket list. This is one of those few places in the state which are completely unknown to tourists and travellers. Let's move ahead and know more about this historic town. As Ikkeri experiences a bearable weather throughout the year, it is a year-round destination. However, if you still want to avoid visiting it during the summer season and escape its hot weather, then the best time to visit it is from August until the end of April. This is the period when the lush green surroundings of Ikkeri wake up in full glory. 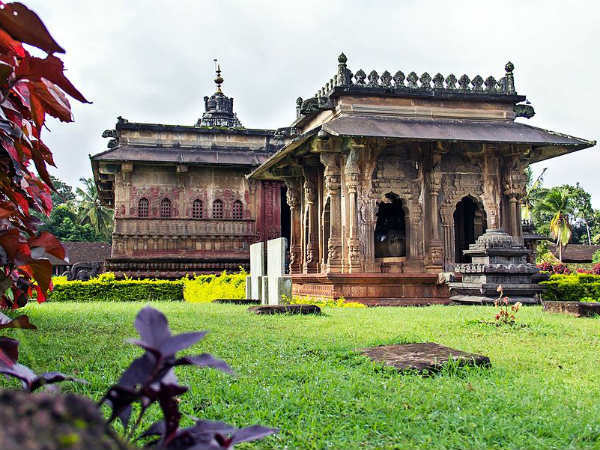 Ikkeri is a small hamlet in the Sagara taluka of the Shimoga district and is popular amongst locals and a few offbeat travellers for its marvellous Aghoreshwara Temple, which was built several centuries ago. The temple is of great historical, religious and architectural significance. Ikkeri served as the capital city of the Keladi Nayakas for about 90 years in between the 16th and 17th centuries. Therefore, it makes for a perfect weekend escape for several historians. As the region was also ruled by several dynasties, including the Chalukyas and the Hoysalas, after the Keladi Nayakas, it has a lot in store to be explored. It is one place where you can learn about the unknown history of Karnataka. Hence, do not miss visiting this age-old settlement and exploring its ancient architecture. Ikkeri is a destination for those who have an immense interest in Indian history and ancient architecture. It is here where you can learn about different dynasties of Karnataka and it is here where you can scrutinise the hidden Dravidian style of architecture. Apart from visiting the wonderfully built Aghoreshwara Temple, you can also visit the amazing Rameshwara Temple which is located at a distance of around 10 km from Ikkeri. All these temples showcase the marvellous artistry of ancient Karnataka in the form of intricate designs and carvings. If you are not satisfied with the above-mentioned tourist spots, then you can also visit the nearby destinations of Varadahalli, which is home to Shri Sridhara Swami Ashram, and Varadamoola, which is perfect for a relaxing escape. By Air: The nearest airport to Ikkeri is located in Mangalore at a distance of about 190 km. Once you have reached the airport, you can either hire a direct cab to Ikkeri or catch a public transport to reach Sagara and then from there, a cab to Ikkeri. By Rail: The nearest railhead to Ikkeri is located in Sagara at a distance of about 6 km. From Sagara, you can either take a direct cab or use local transport to reach Ikkeri. By Road: Ikkeri is easily accessible by road on account of its well-maintained system of roads.